1. Where the trailer and other promotional materials suggest suspense and reveal very little information about the movie thereby triggering the curiosity of the viewer to watch the film. 2. Revealing the plot with an array of high points and tempting the audience to watch the film to gain more details about the same by watching the film. Director Vignesh Shivan half-accomplishes his goal with his move to cast Vijay Sethupathi and Nayanthara in the lead. To be precise, the whole casting idea has done wonders to this simple yet cute story of his. For the audiences who have enjoyed Vijay Sethupathi’s body language and dialogue delivery in his previous works, they will have a new element to add to their list, as he showcases a high degree of admiration and love through his eyes, in every frame he shares with Nayanthara. Nayanthara as a bold girl with hearing impairment does an extremely convincing and satisfying job with her performance. She looks fresh, homespun and is a girl that any man will fall in love with. Radhakrishnan Parthiban never fails to enthrall the audience with his appearance, be it on stage to deliver a speech or as a gangster with a twist in the case of NRD. The banner Wunderbar Films is becoming synonymous to the phrase ”entertainment uncompromised”. NRD won't give you a larger than life experience but will definitely touch you with its simplicity and innocence. One gets to catch Balaji in the form he is most admired in; The RJ Balaji form! Radhika Sarathkumar yet again shows her command on screen and will be remembered for this role too. Special mention to Anandraj, Mansoor Ali Khan, Rajendran and all the other artists who do their best. NRD can be confidently called an Anirudh ‘Musical’. After watching the film you will know the reason why the word musical is within single quotes. The songs join hands with the director to tell the story. Background score sets the mood right. Overall Rockstar Anirudh is indeed a magic and a boon to this unsophisticated story-line. Is it because the story is set in a city like Pondicherry or is it the spell of George Williams’ lens that makes every frame look so lavish and rich? One wonders. With an icon like Sreekar Prasad on board, one is not surprised with the precision in the length of shots or the crispness in the scenes. Naanum Rowdy Dhaan is sure to entertain you and your family this festival season. This is a film that you can just relax, sit back and enjoy with a tub of butter popcorn! 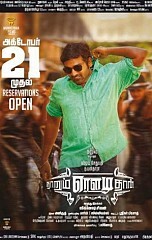 Verdict: He is an entertaining rowdy, go watch him. You can't agree more.